I get the same thrill every single time I watch it, without fail. Yes, let me rave about it some more. 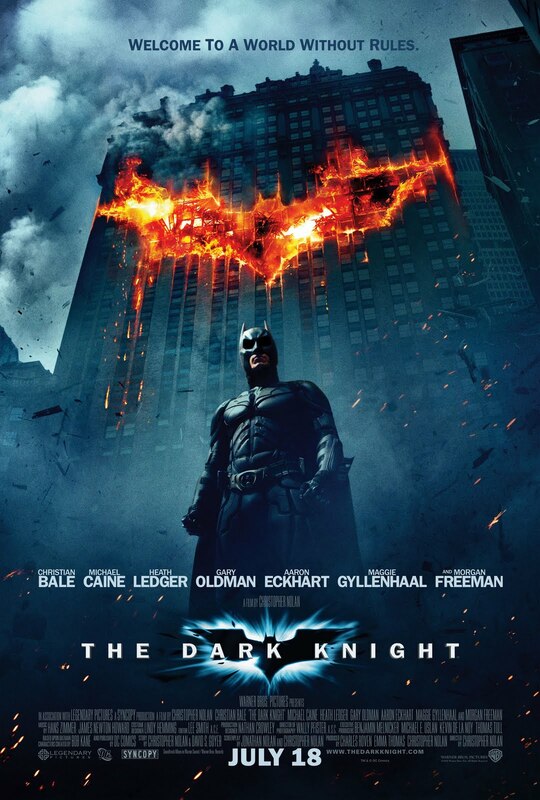 This is truly another masterpiece from Christopher Nolan, and everything was just as it was supposed to be. The cast was fantastic (again), and Heath Ledger brought so much to the table with his performance, though it was heartrendingly his last. The day he died we really did lose one of the greats and I will always maintain this. Hans Zimmer composes us a beautiful and perfect score for this, and it only makes everything you see that much more amazing. He truly is a phenomenal composer, and adds so much to all the projects that he works on. I love that this was also not a simple plot, and it was constantly being changed up. This is the Joker, after all. Nolan gets the villain thing. Again, we know Batman must triumph, but the Joker is so mesmerizing you want to give him free reign of Gotham and just see him tear to it to the ground. The Joker thrives on chaos, no more, no less, and I think The Dark Knight captured that perfectly. The effects were also incredibly well done, and the cast all came together to give us something to chew on. Aaron Eckhart was so good as Harvey Dent, he was the White Knight of Gotham, he was someone you could back, a man of integrity and honour and nerves of steel, and his descent into the underbelly of Gotham and being thrown from his pedestal was intense and painful to watch, and you can get why he would lose his mind. The movie is infinitely quotable, and there are so many cool little things strewn throughout this (the small tidbits) that make it so great (think the Joker’s vegetable peeler between all his knives). I am still a fan of Christian Bale as Batman, he is fantastic, and he really handled the material well for the film, being torn between fighting for Gotham as well as turning himself in to stop the Joker. Bruce’s relationship with Fox is still one of those fantastic ones. I was also a fan of the brief sighting of the Scarecrow, because you all know how much I loved Cillian Murphy in that one. There is so much to rave about in this movie… the action, the script, the performances, the score, the effects, truly. It is a phenomenal watch, and remains my favourite of the bunch just because it is so chaotic, crazy and out there. I have never, ever gotten around to seeing this movie, and I have no idea why not. It isn’t even because the subject matter makes me uncomfortable, it doesn’t faze me. I am always shocked to know that there are still so many people out there that get offended about people choosing who they wish to love and spend time with. It is an immensely private thing and has nothing to do with anybody, but that is just my opinion. Anyway, I know that this movie sparked controversy when it was released, and there is still a little taboo around the whole subject and jokes to boot. I just want to state that it is testament to the acting chops of both Ledger and Gyllenhaal that the roles that they took did not cripple their careers. Moving on to the movie itself, I thought it was shot really well and it was engaging and it was sad. Like “oh my gosh, that’s horrendous”. And not because the movie is so much pushing for and demanding you be sad, because let’s face it, Ennis Del Mar could be a real dweeb and you could not quite agree with what he was doing to his wife, no matter what the times, and I felt sorry for Alma Del Mar for knowing that he husband was not straight, but pretending anyway, but sad because it just gets under your skin, it has such a subtlety about it at the best of times. Damn, the era was different, but not so much so that we don’t still hear about stuff like that nowadays. Sexuality is still something that people hide and guard because of society’s views, and this movie shows the effect that being incapable of being yourself has on one, as well as the inability to accept who and what you are because of the standards set by society. Gyllenhaal and Ledger both delivered top notch performances, and got into their roles and made them convincing, not some roles that some popular Hollywood actors had taken on for money or controversy. They really embodied their characters, and Ledger excelled at being the angry, confused, silent one, whereas Gyllenhaal truly perfected Jack Twist, the dreamer, the chance taker. It was a bittersweet thing to watch Ledger in something again, what a loss 😦 This really was an absolutely amazing performance from him. Brokeback Mountain was shot well, had a score to match the setting (though totally not my kind of thing) and riddled with solid performances all round, from the wives to the extended families, it all comes together well. However, the driving force behind the movie will still remain the relationship between Jack and Ennis and the performances that Ledger and Gyllenhaal gave us to realise these men. 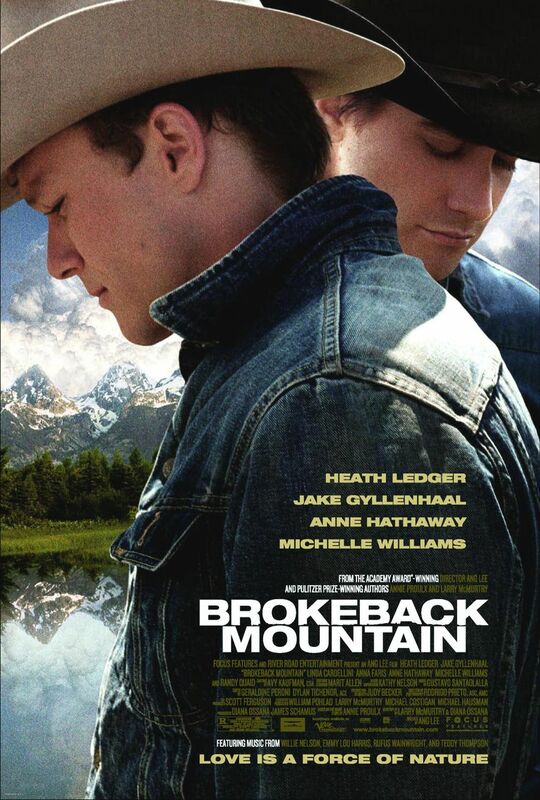 Brokeback Mountain is a dramatic romance, and it is a beautiful flick all round. I think this was a great Blind Spot and I would highly recommend this movie to anyone, not just for the romance involved, but because it is a solid movie in quite a few ways. This scene makes me laugh every time I see it. I know that sounds pretty screwed up, but come on! It was great. It was also the first indication that we were going to get a darker and more insane Joker than the Joker that Jack Nicholson gave us in Batman (1989). The magic trick demonstrated here was little league in comparison to where Heath Ledger took The Joker. 10 Things I Hate About You is one of those rom-coms that will not totally sicken guys. In fact, it is pretty amusing, extremely nineties and backed with a great cast. Watching Heath Ledger as the bad boy is always a treat, and seeing how he gets in under Kat’s skin is a gradual process but it works. However, when things went sour and she wrote her English poem for him, it really brings things into perspective. Let’s not forget that it was one of the best love poemsto be heard in a really long time!